Wanna see how this extension works? TRY LIVE DEMO NOW! Barcode Management for Magento helps to manage inventory and sales report as a must-have tool for retailers and distributors. 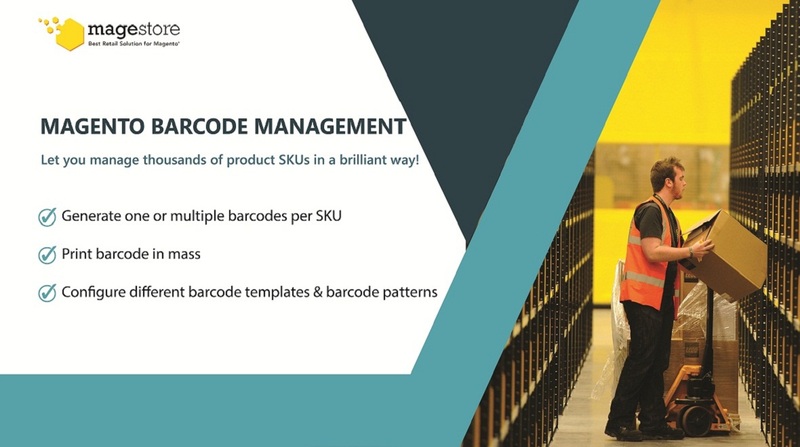 If you would stick in the situation of having no idea how to manage products properly and track them quickly as well as accurately, “Barcode Management M1” is such an ideal solution for you. Barcode listing page will support strongly in how to choose barcode filter by any attribute (such as ID, SKU, supplier, purchased time and so on). Besides, users are able to any action on this page to make it fit with their own demands (view details, generate, update, print or delete barcode). “Barcode Management M1” also allows users to create more than a barcode for SKU. Even when it’s created successfully, users are able to view barcode history details and product information. Find products in a blink with “Scan Barcode” feature. Once you take this action, all the product information instantly show up on screen and you are allowed to edit just in need. Print barcode label in the most convenient way is the thing you can find out with this extension. Especially, users are able to tick and print different barcodes at once. When coming to Barcode Setting, it’s so easy to customize all the tools to meet your own demands. Users can choose 3 different types of templates which are A4, Standard & Jewelry. More than that, you are also able to set barcode template default for printing.